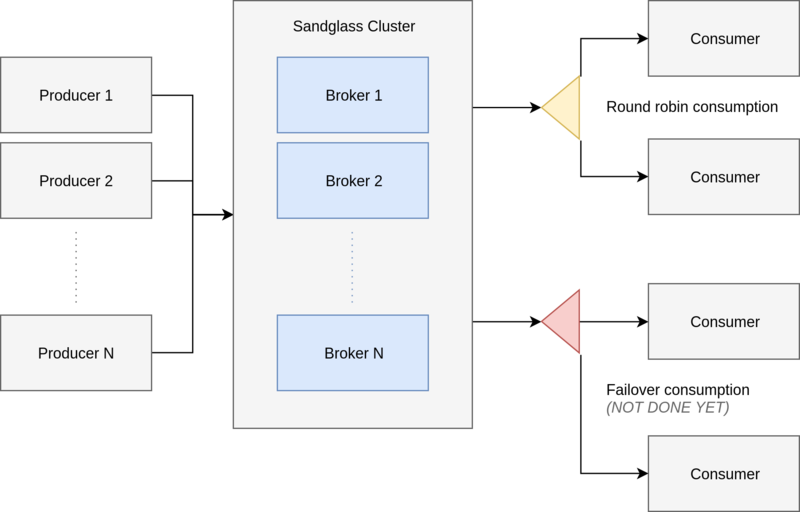 Sandglass is a distributed, horizontally scalable, persistent, time ordered message queue. It was developed to support asynchronous tasks and message scheduling which makes it suitable for usage as a task queue. EXPERIMENTAL: This is a prototype of a side project. This should not be used in production in its current form as things may change quickly without notice. For other platforms, you can grab binaries here. NOTE: All data will be stored in /tmp/node1. If you wish to change this, copy demo/node1.yaml and modify it accordingly. We are using a single node cluster, this is not recommended for production. and repeat the same steps described above for another topic and increasing the replication factor to 2. As previously asked (#4), the purpose of this project might not seem clear. In short, there is two goals. The first is to be able to track each message individually (i.e. not using a single commit offset) to make suitable for asynchronous tasks. The second is the ability to schedule messages to be consumed in the future. This make it suitable for retries. Documentation is a work in progress and still lacking. The documentation is available on godoc. This will produce a message that will be available for consumption in 1h. Interested in having client for one the following languages ? Support is planned but there is no specific schedule. So, if you are interested to quickly have a client in your language, help is welcome! Check the raw generated code available on https://github.com/sandglass/sandglass-grpc and feel free to submit your through a pull request to https://github.com/sandglass/sandglass-client. A topic has a number of partitions. Data is written into a single partition. Either the destination partition is specified by the producer. Otherwise, we fallback to choosing the destination partition using a consistent hashing algorithm. Each produced message to a partition writes a message to a Write Ahead Log (WAL) and to the View Log (VL). The WAL is used for the replication logic, it is sorted in the order each message was produced. The View Log is used for message consumption, it is mainly sorted by time (please refer to sandflake ids for the exact composition) for a Timer topics and by keys for KV topics. When consuming sandglass starts from the last commited until the last consumed message to check the redelivery of messages. And from the last consumed offset until the last produced message to deliver the new messages. These two actions are done in parallel. Want to contribute to Sandglass ? Awesome! Feel free to submit an issue or a pull request. This project is licensed under the Apache License 2.0 available here.